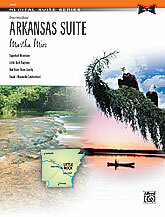 Explore the sights and sounds of Arkansas through movements written in four different styles in this suite. Students will travel to majestic Sugarloaf Mountain; experience a little ragtime in Little Rock; float gently down the Red River and celebrate at a Maumelle hoedown. Ranging from flowing; romantic melodies to energetic ragtime; the music teaches rhythmic control and precision; and allows for tasteful rubato and pedaling. Intermediate.